A well written article by Steve the owner/CEO of Yale Appliance in Boston entitled “Why doesn’t every appliance brand and store offer service?” has inspired me to share our story as it pertains to service. Here’s our service story. I’ve got a short version of a long story. That’s still a long story, so I’ll do the abbreviated version of the short version. In 1980, when we started, most appliance dealerships didn’t offer in-house service (most still don’t); our company, like every other appliance dealership would refer our customers to service companies when their appliances broke. Around 1983, we supplemented these referrals with techs we hired so that we could be more responsive. This went on for 2 decades and was a bit better than the dealers we were in competition with. After reading “Good to Great” by Jim Collins in 2002, everything changed. Being good was no longer the goal, we needed to set our sights on being great. High end appliance sales were increasing at that time and the service providers we referred to seemed to care less and less about the customer’s experience (they were being put through the wringer; Ok, I promise no more appliance puns). The time for half measures had passed and we needed to build a service department for our customers that would be great. I was soon to learn why appliance dealers no longer offered service. Everything about service would prove to be difficult. Folks who call in for service are understandably upset because their product is broken; our customer service agents taking these calls need to be empathetic, efficient, and able to juggle 5 balls with one hand. Hiring competent technicians would prove to be near impossible as Vo-Tech centers have quit teaching appliance repair (eventually we started our own tech apprenticeship program). I could go on and on about our difficulties, but this is the abbreviated version of the short version, really! 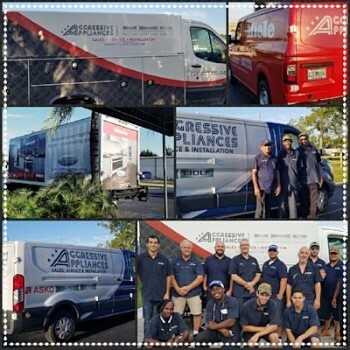 Fast forward to 2009, my son Jeff joined Aggressive as the service manager and grew this department dramatically through the recession years; that in and of itself speaks volumes for Jeff and the dire need for great service in our industry. As of this writing we employ 9 service techs, 14 installation specialists, 5 CSRs, and 2 managers. We still believe that “good is the enemy of great”, and to that end we roll up our sleeves everyday (except Sunday) and are determined that nothing short of great is good enough for our customers.